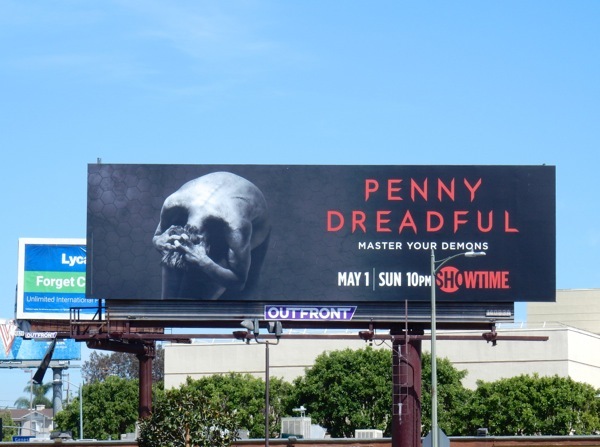 Occasionally a billboard visual comes along that you wonder "who had that idea?" and "how did they know to do that?". 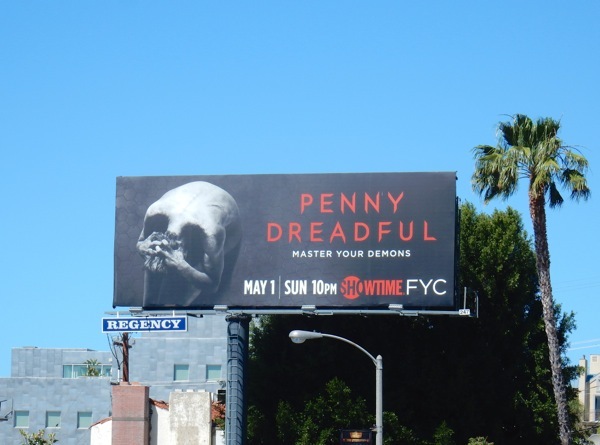 The season three promo 'body skull' key art for Penny Dreadful is just such an example. Judging from the revelations of Josh Hartnett's werewolf nature last season, we're guessing that this may be his scarred back with his hands clasped over his head in pain or rage, to create the illusion of a human skull (although considering all the other tortured souls in Showtime's horror fantasy series, any number of the cast could be wrestling with their inner demons). The gothic Victorian-era drama will see the characters initially scattered around the globe, with Hartnett's 'Ethan' sent home to the American Wild West to his father, Timothy Dalton's 'Sir Malcolm' traveling to Africa to bury his friend and man-servant 'Sembene', Rory Kinnear's 'Creature' in self-imposed exile and Eva Green's 'Vanessa Ives' on her own and questioning her faith. 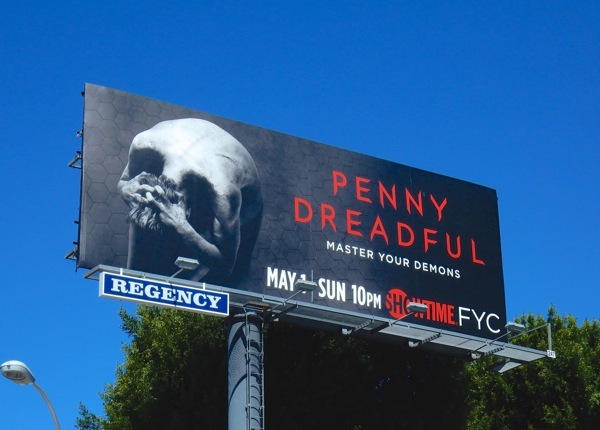 In addition to vampires, werewolves, Frankenstein's monsters, immortals and witch covens, this season will also see the introduction of the infamous 'Dr. Jekyll' (and his alter-ego 'Mr. 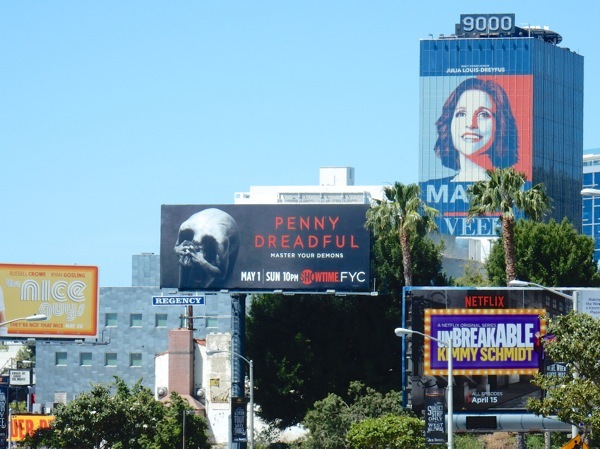 Hyde'), plus Patti LuPone (who previously played the 'Cut-Wife') returns as a new character from Dracula lore, 'Dr. Seward'. 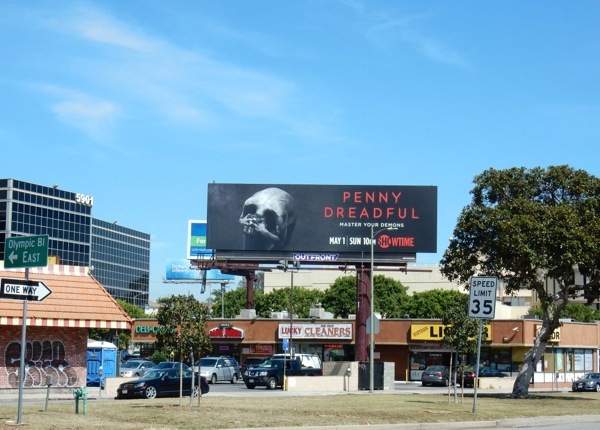 These spectacular season three billboards were spied along San Vicente Boulevard on April 19 and above West Hollywood's Sunset Strip on April 22, 2016, and if you're a fan of the show, be sure to check out these previous season billboards for Penny Dreadful. 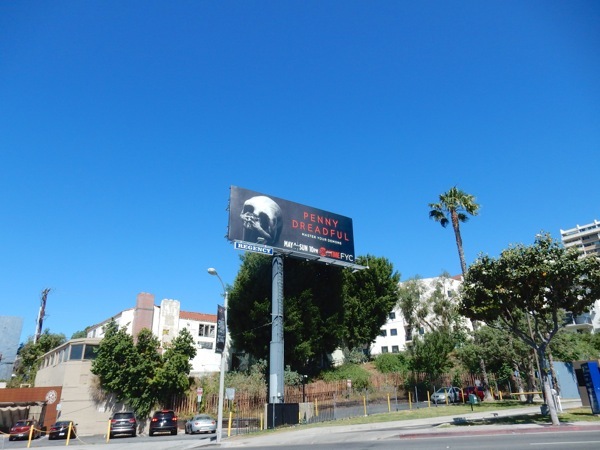 The ad design also brings to mind the Sons of Anarchy season seven billboard which also featured a 'skull back' ad creative of a different kind. 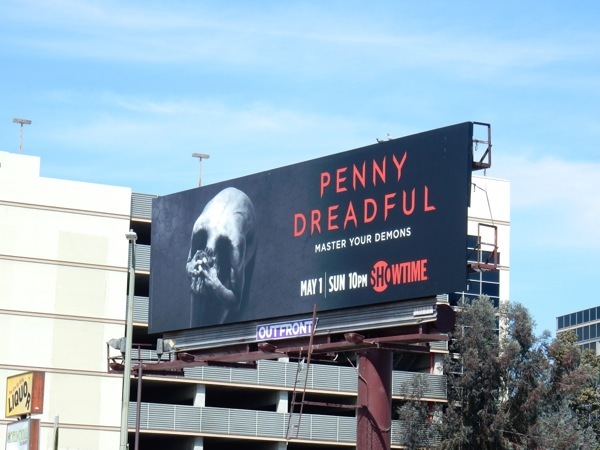 Imagination is an amazing thing, and Daily Billboard can't wait to see what further delights and frights the third season of Penny Dreadful will deliver this Summer.